Daniel Scrivens seen in a file photo in his office at Auto Value. He died Jan. 14, 2019 at the age of 94. 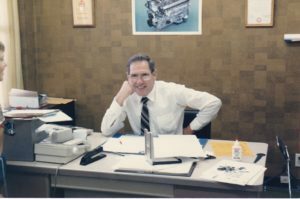 The man who set the tone of the aftermarket – especially out west – has died. Daniel Scrivens died suddenly at the age of 94 on Jan. 14 in Calgary but left behind a legacy that few, if anyone, can match. He had a long and storied career in the Canadian automotive aftermarket in Western Canada. After he was trained as a mechanic while serving as a soldier in the British army, he used his knowledge to work in a number of garages in his early career. Scrivens eventually owned a Gulf Oil gas station with three service bays. He got into the jobber side of things after his service station lease expired. In 1975 with his wife Barbara, they opened Automotive Village Parts. Scrivens knew what customers wanted and was at the forefront of defining what it meant to buy auto parts. 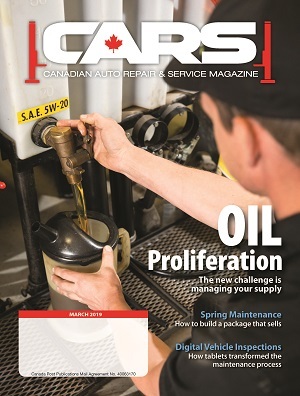 “The mid-70s was the birth of automotive retail in Western Canada,” said long-time colleague and friend Sean Corcelli, who retired from Uni-Select as its regional vice president of the Prairies division in 2017. Scrivens pushed for bigger, brighter and more colourful showrooms. He was keen on merchandising and committed to inventory. “Customer service was his focus. He lived and died to make sure the customer was looked after properly and politely. He demanded that his staff were clean, tidy, professional and wore uniformed shirts,” said Scrivens’ daughter, Janice, the company’s retail manager and first employee. 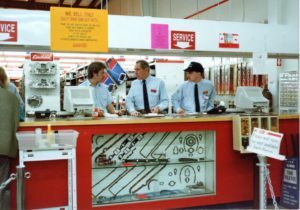 Daniel Scrivens, centre, behind the counter following the opening of a new location of his then-Bumper to Bumper Forest Lawn store in 1991. His made sure his business went hard after the do-it-yourselfer after noticing that traditional jobbers were ignoring the market. “Do it yourself – a phenomenon sweeping the aftermarket,” Corcelli remembered of that era. A couple of years later, the store adopted the Bumper to Bumper name under Acklands and grew throughout Southern Alberta, with family playing integral roles in helping the growth of the business. “He put us all to work and we had to work harder than any staff member because we were the example,” Janice said. After Acklands moved its distribution centre to Edmonton, Scrivens opened a warehouse, Central Auto Parts, in 1989 after in order to feed his stores directly and quicker, rather than waiting for parts to travel down Highway 2 overnight. The company built a new three-floor, 64,000 sq-ft facility in 1999. 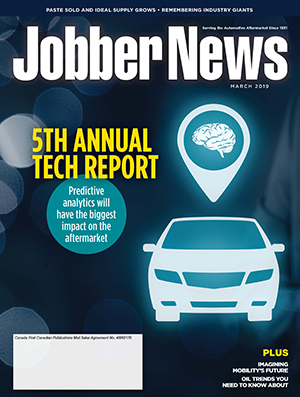 “[It] was opened to house the automotive inventory that Dan demanded to be on hand to service their stores and loyal customers,” Corcelli said. “His philosophy was, ‘I want the parts people want and I want them in stock.’ Inventory was absolutely his passion,” Janice said. 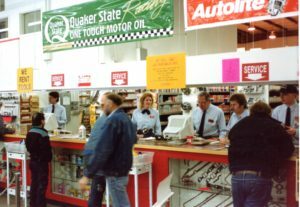 Inside the Forest Lawn store in 1991. 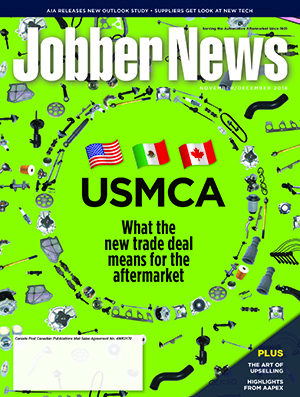 In 1996, Scrivens left Bumper to Bumper and became a shareholder in the Aftermarket Auto Parts Alliance. He changed the name of his stores to Auto Value, of which there are 14 locations today. Scrivens was remembered as a kind, honest and fair person who loved people and made it his business to go out of his way to speak with customers, friends, employees and even strangers. It was a trait that continued into retirement. Janice told the story of how her father visited the distribution centre and one of the stores on Christmas Eve and spoke to each employee and shook their hand. “He didn’t play favourites. He spoke to everybody – everybody,” she said. What also set Scrivens apart was his ability to be ahead of the curve. “Always with a keen eye for product and merchandisers, Dan was occasionally frustrated awaiting the industry to ‘catch up’ to him,” Corcelli said. Scrivens also spent time as a member of the Automotive Industries Association of Canada and the local Rotary Club. 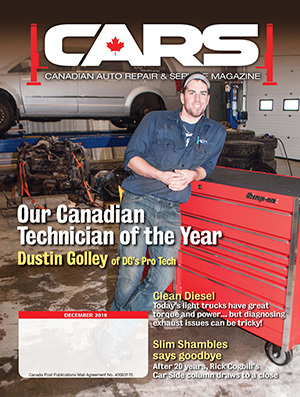 The industry is also remembering him as a driving force behind establishing the presence of the aftermarket in Western Canada. Scrivens had six children, 16 grandchildren and six great grandkids. A celebration of life was held Jan. 20 with 300 people in attendance. Have a memory of Dan Scrivens that you’d like to share? Let us know in the comments below. Dan was an amazing guy. I always admired the respect he always showed his people and how much he understood how important the staff was to the success of the organization. He embodied integrity. My condolences to the entire Scrivens family. He will be missed deeply. I want to express my condolences to the whole Scrivens family. My experience with Dan’s children I have been very impressed. They are great individuals and very good Parts people. I am sure Dan was very proud of all of them. I hope everyone can find peace. Dan was a wonderful person that cared about everyone, when I worked with him, I was going a family member that was really sick, and had pasted. Dan’s understanding and help me through my very difficult will never be forgotten. Dan is and was a true angel, and the only comfort is that he is still watching all of us, smiling like he did. Proud of his family and all the wonderful people he was able to meet and help with his warm smile and understanding of what people needed to help them. My condolences to Dan’s family. This angel will be truely missed.